Of this year’s Best Picture Nominees, Lion (2016) is certainly one of the more . . . artistic ones. Heck, the title of the film wasn’t clear until directly before the credits. In part due to the subject matter and the culture in which it takes place, this film can be hard to watch at times. The audience has to come to grips with the poverty and difficult living conditions present in India not only 25 years ago, but today as well. Perhaps it’s my need to watch movies that help me to escape from these realities, but it was challenging to be shown such a stark view of another country’s reality. While I understand that the larger, overarching message of the film is to bring to light the social issue of lost children in India, the more inspiring subplot had to do with adoption. Many couples have a lot of different reasons for wanting to adopt, but I have to say that the couple portrayed by Nicole Kidman and David Wenham certainly had the noblest reason imaginable. Even with this admirable goal in mind, an adopted child will likely want to uncover their past, especially if there are still questions to be answered. On the flip side of stark images of poverty, this film merely reinforced that we live in the future. The amazing capabilities that technology affords us is really what made this film possible. The ever-increasing proliferation of free and accessible information allows us to take our fates into our own hands. Whether it’s for education to help break a cycle of ignorance or to track down long-lost family members, the information provided by the internet has an endless amount of uses, just as long as you’re willing to put the effort in and use the tool that it is. 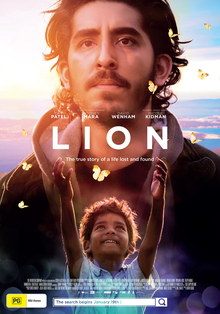 A film about a boy with boundless determination and courage, I give Lion 3.5 stars out of 5.